Hill Country Red is a Texas heirloom okra variety. 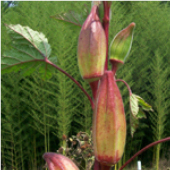 This unique type of okra has 3-6″ fruit that is red and greenwith red stems. Though it looks a bit different than the usual green, it is bursting with great okra flavor. This variety is also great for pickling.